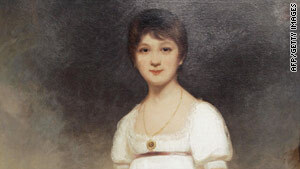 This work by British painter Ozias Humphry is the only known oil painting of Jane Austen, believed to be aged about 14. London, England (CNN) -- It is a truth universally acknowledged -- or nearly so -- that Jane Austen, the author of "Pride and Prejudice," died of a rare illness called Addison's disease, which robs the body of the ability to make critical hormones. Katherine White doesn't believe it. White, herself a sufferer of Addison's disease, has studied Austen's own letters and those of her family and friends, and concluded that key symptoms just don't match what's known about the illness. The disease -- a failure of the adrenal glands -- was unknown in Austen's day, first having been identified nearly 40 years after she died in 1817 at the age of 41. Cope's article, published in the British Medical Journal in 1964, came to White's attention a couple of years ago. "When I read the summary that Zachary Cope had done of her symptoms, I thought, well, that's not right," White told CNN. She zeroed in on a comment Austen made in a letter to a friend less than two months before she died: "My head was always clear, and I had scarcely any pain." That's not what Addison's sufferers normally say, White says. "People tend to get a thumping headache and feel like they have the hangover from hell," she said. Saint Elizabeth of the Trinity, who died of Addison's disease in 1906, compared her own suffering to being crucified, White observed. Patients also tend to have difficulty remembering words, and suffer from slurred speech, sleepiness and confusion. Austen, by contrast, dictated a 24-line comic poem to her sister less than 48 hours before she died. White is not the first to dispute the theory that Addison's disease killed Austen. British biographer Claire Tomalin suggested in a 1997 book that lymphoma was the culprit. White finds that, too, unlikely. She suspects the answer is much simpler: tuberculosis. Tomalin "was still thinking [of] first world [diseases]. She went for lymphoma on the advice of doctors," White argued. "If you think about TB [tuberculosis], which was rife in Jane Austen's day, statistically speaking, [the cause of death] was far more likely to have been TB from unpasteurized milk rather than an obscure condition like lymphoma," White said. Austen biographer John Halperin isn't sure it matters what killed Austen -- but whatever it was, it affected her writing as her life drew to a close, he said. Her last completed novel, "Persuasion," is "a far more sad and autumnal book than any of the others," he said. "You get the sense that decisions delayed never return. That came home to her very clearly in 'Persuasion.' The tone is a very sad one, even though the heroine does marry the man she loves in the end," Halperin said. In fact, Austen's papers show she considered another ending in which the heroine did not marry the man she loved. Halperin believes Austen died of Addison's disease, he said, though he points out that his biography, "The Life of Jane Austen," was first published in 1984, and that there has been significant research into the disease since then. White, who is trained as a social scientist, not a doctor, is the coordinator for the Addison's Disease Self-Help Group's clinical advisory group in the United Kingdom. She published a paper this week in the journal Medical Humanities making her case. The paper, "Jane Austen and Addison's Disease: an unconvincing diagnosis," admits that some of Austen's symptoms were consistent with adrenal failure, and points out that we may not know all of Austen's ailments because her sister Cassandra edited or destroyed many of Jane's letters. But Kenneth Burman, an endocrinology expert at Washington Hospital Center in Washington, finds White's argument plausible. Like White, he speculates that Austen could have suffered for years from some disease that affected her adrenal glands but that the actual cause of death was different. "It's most likely that she had chronic adrenal insufficiency and that the final cause could have been secondary infection such as TB," he said. He, too, doubts Austen had lymphoma, which tends to produce enlarged lymph nodes in the neck, swelling in the stomach because of enlarged liver or spleen, and salt cravings -- none of which were documented in Austen's final days. "I agree completely" that it's simply statistically more likely that the novelist would have had tuberculosis than lymphoma, he said. But, he cautioned, we'll never know for sure. "Retrospective diagnosis is very speculative," he said. "It's unknowable with certainty." Or, as Austen herself wrote, "Seldom, very seldom, does complete truth belong to any human disclosure; seldom can it happen that something is not a little disguised, or a little mistaken."